Oh man ! !.Now I love baking cake ,once I captured the skill! 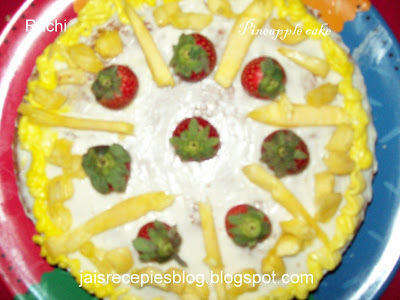 !.Yes,I baked cake but this Pineapple Cake is exotic flavor!! Play around the ingredient a bit, mix and match the flavor and it's turn out really good! !The texture and moistness of this cake is better than the previous one!.Hubby like cake with some icing,so I use/tried some butter icing . My hubby& my kids loved the cake. 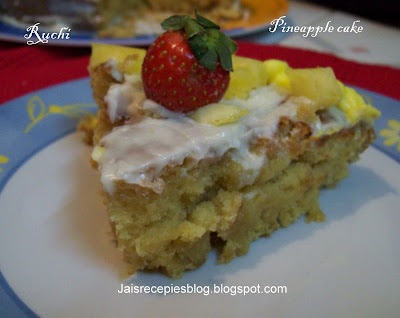 This Pineapple Cake is a delight for me!. 1/2 cup -white sugar(add a little sugar if you think it isn't sweet enough). 1. Sift the flour + baking powder + salt + corn flour. Then Beat the butter and sugar well with beater till very thick. 3. In a large bowl, mix all the cake ingredients together (except the demerara/brown sugar) until the flour is incorporated. The batter will be quite thick. 4. Add vanilla essence + pineapple essence and beat for 1 min. 5. Scrape batter into a greased 6" round cake pan. Even it out with the back of a wetted spoon. 6. Then sprinkle the brown sugar over the top. Preheat oven Bake at 180C. 7. Turn gently into tin and bake for 30-35mins till done or till the cake tests done and has pulled away slightly from the sides. 8. Chop the pineapple bits into tiny pieces,and reserve some bigger bits for the topping. 9. Whip 400ml whipping cream with 4tbs pwdrd sugar +1 tsp pineapple essence until thick and holds peaks. 10. Take about 1/4 a cup of cream(approx 4-5 tbsp), and colour it with yellow food colour. 11. Spread the remaining cream over the top and sides of the cake. 12 . Pipe a border with the colored cream. Chill well before serving. wow, lovely cake! pretty decoration! So soft and yummy! 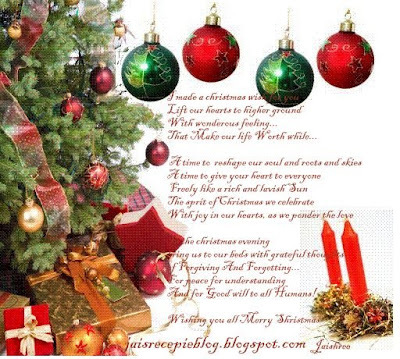 Christmas card is such a nice creation! Great job! Delicious cake, nice persentation. Send me a piece jaishree. gosh! what a pretty cake? i wanna grab it right away..
looks delicious and a good treat for new year! Thank u Priya,Rekha,Trupti,srilekha,Uj,Gita, srilekha, sharmi,for yourcompliments. This cake looks so good I will try it this weekend. Great job!